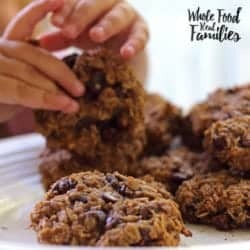 Healthy Oatmeal Breakfast Cookies are easy, fast and delicious! They are also healthy enough for breakfast! Perfect for those mornings when mom hits snooze on the alarm one too many times! Healthy Oatmeal Breakfast Cookies We LOVE! We discovered the breakfast cookie a couple of years ago during the middle of the school year slump. You know, when everyone is used to the routine of getting up early but dreading it anyways. Keeping Oatmeal Breakfast Cookies on hand solved the problem of breakfast when we (and by we, I mean me) hit the snooze one too many times. My kids loved grabbing them to eat in the car! Generally, when these are breakfast, I make them with raisins or cranberries. But occasionally, I toss in chocolate chips and reap the rewards of being the coolest mom ever. When we go on vacation, we prefer to rent a house if we can swing it. Our family is just big enough that a single hotel room just isn’t enough space, especially if we are going for a week. This past summer, we lucked into a house with a nice big kitchen, which means most of our meals were cooked there. Oatmeal Breakfast Cookies are Easy to Make! Around mid-week, there were a few languishing bananas that were going to be smoothies until I noticed two things – our house did not come equipped with a blender. And we had rolled oats we had brought from home with the plan to make this Apple Cinnamon Oatmeal for breakfast one morning. So the oats and bananas got together and updated our favorite Healthy Oatmeal Breakfast Cookie recipe. I must say, I like this one better than the one I used to use. Vacation for the win! Breakfast Cookies Mean Less Time Cooking and More Time Playing! Our kids also liked this recipe a lot. Not only did this recipe take care of breakfast (okay, there might have been eggs and bacon on the side too.) But they were also an easy snack between trips to the beach and the pool. They were also good at keeping everyone’s energy up while our middle child whipped her dad at Go Fish. I think the Healthy Oatmeal Breakfast Cookie just made it to the vacation approved list. Do you cook while you are on vacation? Or do you mostly eat out? Looking for a more traditional healthy oatmeal cookies recipe? This one uses maple as the sweetener instead of sugar and is definitely a healthier cookie. 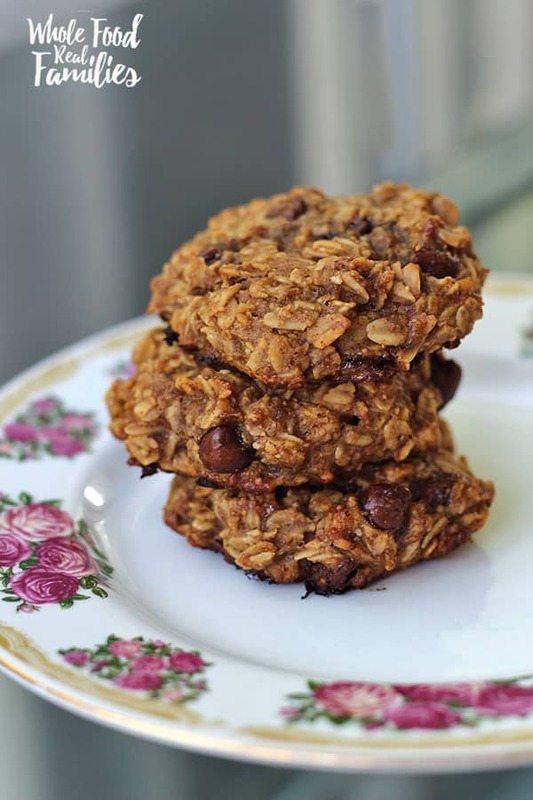 Try these Healthy Maple Cinnamon Oatmeal Cookies. You can also find a collection of our favorite Fall Cookies Recipes to try! Alternate raisins and chocolate chips based on your preference! Mix together mashed bananas, peanut butter, honey, and salt. Add in oats, nuts and chocolate chips (or raisins or cranberries). Stir to combine. Roll approximately 2 tbsps of the cookie batter into a tight ball and drop onto the lined baking sheet and pat flat, leaving an inch or two between each cookie. Bake for 12-15 minutes. Enjoy! Note: if you are gluten free, make sure to use certified gluten free oats to avoid cross contamination. Why do you think that mine did not flatten out? Do these need to be kept refrigerated after baking or can I keep them in my pantry or bring with my for travel? I have always kept them on the counter but they never last more than a couple of days here!! Have you frozen them? Before or after cooking? I have not – they never last that long over here! Though I imagine it would be just fine after cooking or before. Do you think dried apricots would work too? Hi there. I am so glad you like them. We don’t really count calories around here. We focus more on just whole ingredients. But there are lots of services online you can plug the recipe into if that is important to you. Just google calorie calculator. They are so simple! And tasty! I love an excuse to eat cookies for breakfast, this is a perfect excuse! My job here is done… LOL! I love healthy breakfast and these cookies are perfect . Uh, cookies for breakfast?! YES PLEASE! Anything that involves chocolate and is also healthy is a-okay with me!